The 10th edition of the Nursing Diagnosis Handbook makes formulating nursing diagnoses and creating individualized care plans a breeze. Updated with the most recent NANDA-I approved nursing diagnoses, this convenient reference shows you how to build customized care plans in three easy steps: assess, diagnose, plan. 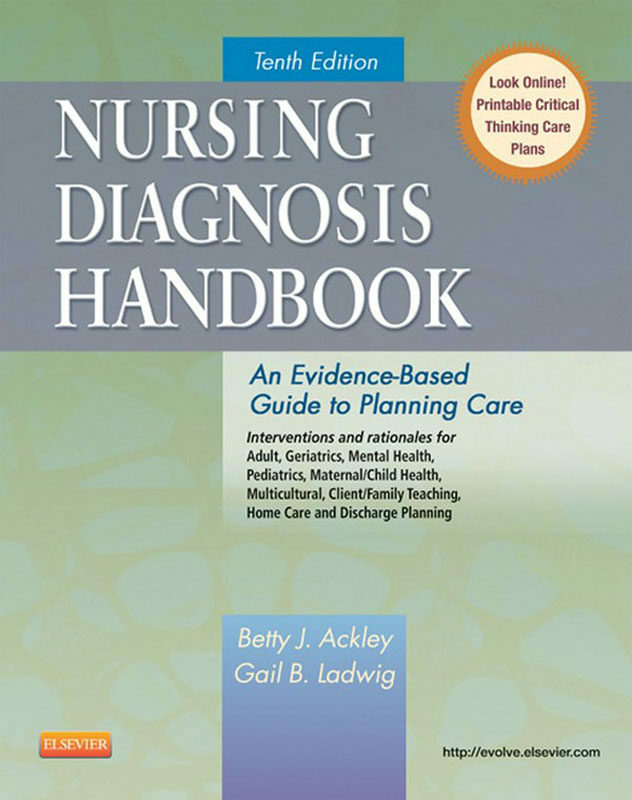 Authors Elizabeth Ackley and Gail Ladwig use Nursing Outcomes Classification (NOC) and Nursing Interventions Classification (NIC) to guide you in creating care plans that include desired outcomes, interventions, patient teaching, and evidence-based rationales. Unique! Care Plan Constructor on the companion Evolve website offers hands-on practice creating customized plans of care. Alphabetical thumb tabs allow quick access to specific symptoms and nursing diagnoses.Suggested NIC interventions and NOC outcomes in each care plan. Recent and classic research examples promote evidence-based interventions and rationales. NEW! 4 Color textNEW! Includes updated 2012-2014 NANDA-I approved nursing diagnosesNEW! Provides the latest NIC/NOC, interventions, and rationales for every care plan.NEW! QSEN Safety interventions and rationalesNEW! 100 NCLEX exam-style review questions are available on the companion Evolve website.NEW! Root Causing Thinking and Motivational Interviewing appendixes on the companion Evolve website. Otros ebooks de Betty J. Ackley.